Another project I’ve been knitting here and there is the Massey Wrap, which I started about 2 years ago. 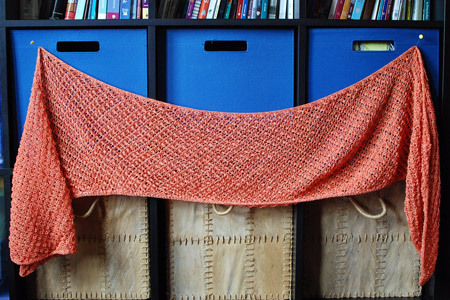 I’ve always loved this project: the yarn, the pattern, and the FO I imagined would come out of it. And then, lo and behold, I finished it! 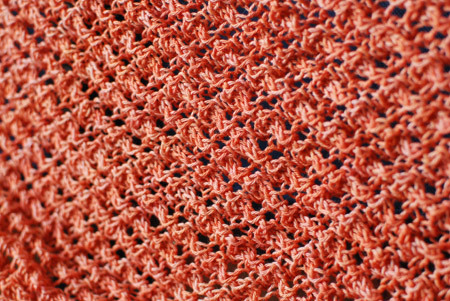 The scarf is, of course, utterly unblocked, but I plan to treat it the same way I did Henslowe, and block it overnight. The yarn is cotton, so I don’t expect it dry as quickly or as thoroughly as the wool used for Henslowe, but should be good enough. Stay tuned for the FO pics! He’ll be 14 months old in less than a week, unbelievable! Love it! I’m totally digging the color – gorgeous! Aww, what a great smile! dang. I am a baby clucker from way back, and getting kind of tired of it, but this little guy just gets me CLUCKING!!!! He’s really really really cute. Lucky you! What a cutie! 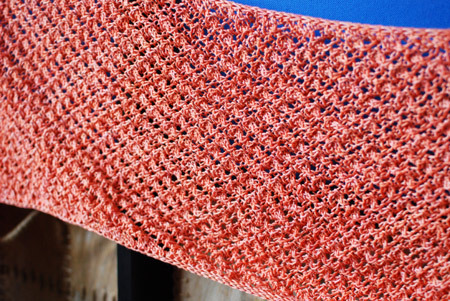 Your wrap looks marvelous, btw, even unblocked! Beautiful knit, it looks gorgeous. Aww! Your son has a great smile, a real cutie. Cute wrap! And your little one has the most adorable and contagious smile! 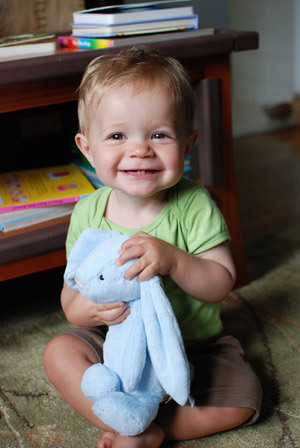 What a lovely picture of your little boy – great smile! Gregory is your finest FO! Love to see a new photo of Gregory. It is hard to believe Gregory gets cuter each time you post a picture of him! I am sure you must enjoy him loads, but I am here to tell you my children are now 38 and 41, and I enjoy them more than ever–which I wouldn’t have thought possible when they were the age Gregory is now. Gregory is so cute!! Like to see what you are knitting – but sure do like to see your little boy! The cutest little guy, evah! He’s a real lady killer! I love his happy baby smile. I don’t have kids, but I have a cat that can open doors. I have to block my knits in a separate room with a strong door or a latch, so I understand how exciting the blocking part can be. Can’t wait to see how blocking opens it up.